SiD is used for many purposes, including sustainable development, urban redevelopment, industry and construction redevelopment, agriculture, policy making, knowledge management, and business strategy. 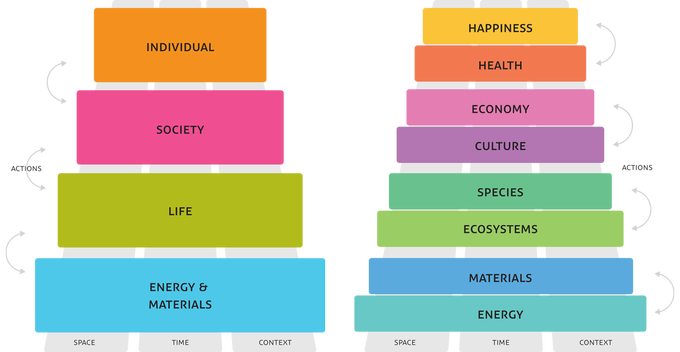 By including aspects such as circular economy principles, bio based design, resilience thinking, climate adaption and social justice, the SiD framework provides a comprehensive solution to our society’s challenges. This article provides a short introduction to SiD, why it exists, how it works and the solutions SiD offers. More information is available in the corresponding articles and you can contact us in case you would like to find out more. Various parties offer workshops and training in the SiD framework, which is open-source under creative commons BY-SA licensing. 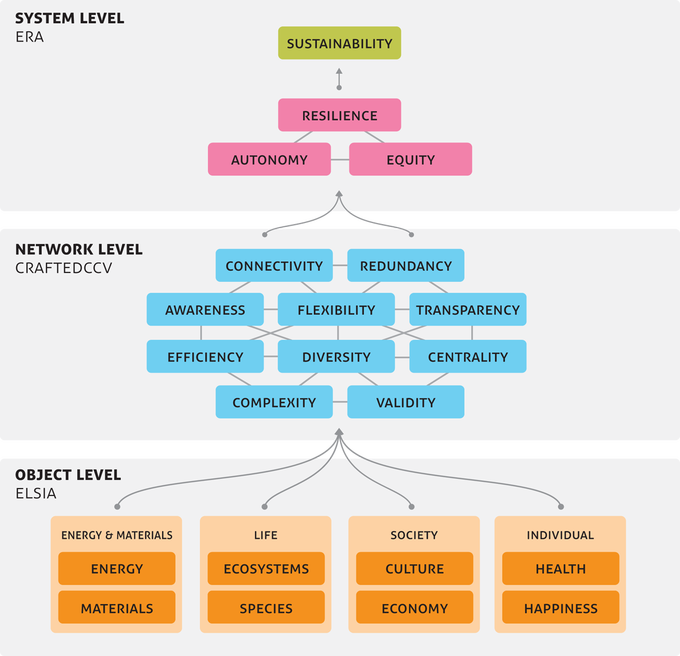 SiD is the foundation of Except's sustainability evaluation, innovation trajectories and cooperative model, and has been applied to over 500 projects worldwide since the start of its development in 2001. The SiD framework arose from our dissatisfaction about existing methodologies and tools to define and develop sustainable solutions. This led us to rewrite the definition of sustainability and formulate an overarching theory. Sustainability is historically ill-defined, resulting in many problems with working on the topic. We aimed to develop a definition that is precise, clear, actionable, and helps safeguard the word from deterioration, as well as provide new avenues for fundamental sustainable development. A vital component of the definition is the first sentence: it tells us to look at sustainability as a system property. Because of this, the main analytical components of SiD are focused on understanding, visualizing, and developing systems. More information and background can be found in the SiD Sustainability Definition article. SiD consists of four core components, the underlying theory, the applied methods, the resulting processes and a set of applicable tools. The SiD theory lays the foundation for its operation, ethics and reasoned approach. It defines systainability, systems, and complexity. It deals with approaching problems on a system level primarily and achieving sustainable cycles in that system. It expands into environmental ethics, network theory and other necessary components. 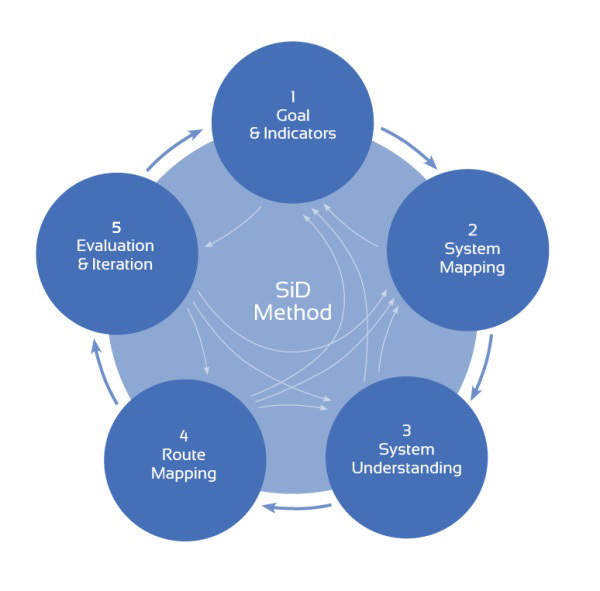 The SiD Method consists of a detailed step-by-step approach to system-level goalsetting, analysis of systems, optimization and system level synthesis and evaluatation. The SiD Process details how the method is unfolded in time and how different disciplines come together to work on a problem together, including stakeholders and potential third parties. 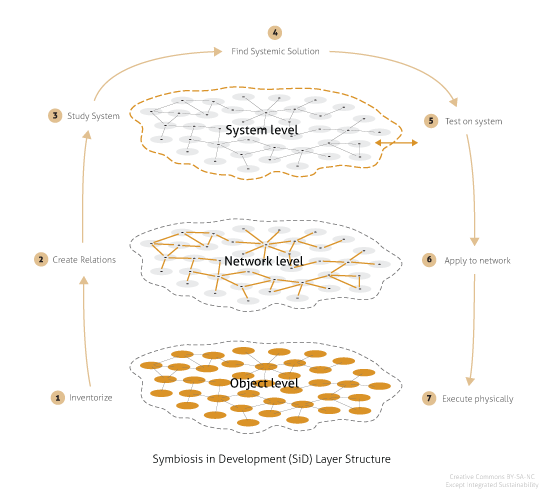 The SiD process combines bottom-up as well as top-down approaches at the same time in an iterative and collaborative working environment. The SiD tools are a collection of new and existing tools that can be applied within a process. They help in performing valueable functions, such as Life Cycle Assessment, Network Analysis, Strategy tools, process tools and various software tools. In effect, a SiD process consists of stringing together a number of Sid Tools. SiD recognizes the need to investigate systems in context, time and space simultaneously. Several tools help to develop this perspective both in a creative and in an analytical assessment way. Each of the dimensions are investigated on various scales, such as long term and short term, close by and far away, and through various levels of connectivity. 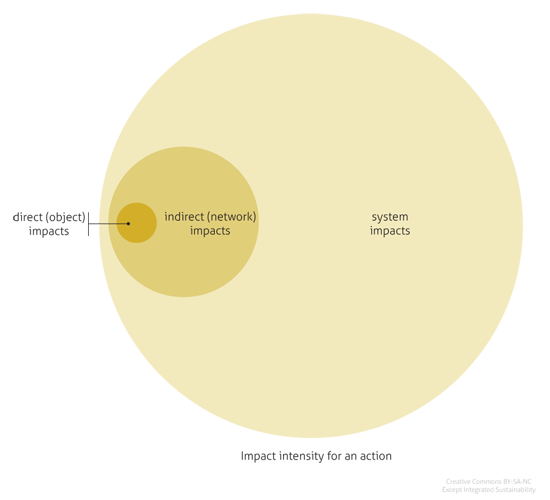 SiD recognizes at least three levels at which actions have impact on our society (or subsystem): first the direct or object level, then second the indirect or network-level, consisting of life cycle effects and others, and a third level: the system level. There are separate indicator sets for each, and they feed indicators from physical elements through network parameters to the system level, where sustainability can be evaluated. See below diagram for an illustration of how this is used in an innovation trajectory. SiD tries to optimize the third level effects – the system level – first as these are in most cases several orders of magnitude more impactful than second or first level effects, as you can see on the picture below. SiD's framework includes full-spectrum analysis tools which aim to take into account all “externalities”. Externalities are costs or effects that are not usually taken into account and are therefore not evaluated, but belay hidden costs and risks as well as opportunities and solutions. Externalities cause many problems in the sustainable field, because most sustainable development tools are not full-spectrum. This results in well-meant solutions ending up being worse for society than not doing anything at all. In order to evaluate on all important categories, we've developed categorization and indicator sets for the three different system layers of system, network and object. An overview diagram can be seen below. The object level indicator hierarchy is called SiD ELSIA and is one of the most used tools of SiD, displayed below. A separate article explains goes into the workings and uses of SiD ELSIA. SiD's methods consist of cycles of action phases that need to happen for a full innovation cycle. The methods can be started at any point, and usually they are cycled several times during a project. Below an example of a SiD method cycle. 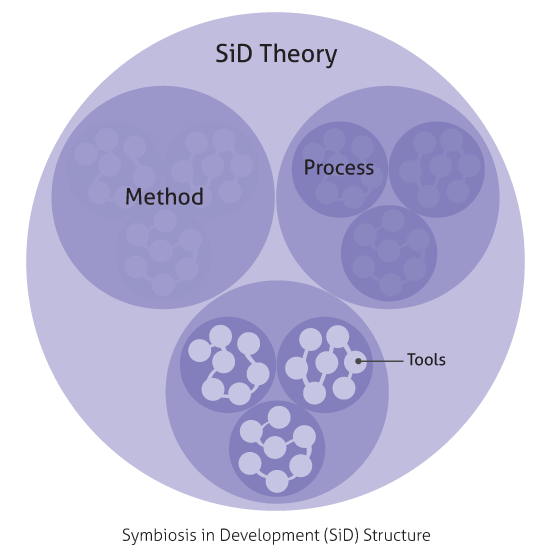 The SiD method brings people together, and lets them cooperate in an efficient, iterative cycle. Usually the method is executing using Innovation Labs, or as we call them: SiD sessions. 5-8 multi-disciplinary experts gather for 5 consecutive days in a single room, where they envision, analyze, map, understand, invent, and evaluate in rapid cycles. At the end of these 5 days, the results are taken and developed using the SiD process. With this approach, amazing insights have been developed in very short timeframes. SiD processes consist of a string of tools that together form a comprehensive project plan. Each process is unique for each project. Individual tools are strung together and arranged in a way so that they follow one or more method cycles. Below an example of a process map for the development of sustainable offices for Schiphol Airport. Each SiD process contains four phases. The formation phase, the intelligence phase, the innovation phase and the development phase. The formation pohase builds the team and the process planning. The intelligence phase typically consists of trend analysis, precedent research, stakeholder analysis, data analysis and a summarizing systems analysis quickscan. In the innovation phase the SiD method is cycled through rapidly in the SiD co-creation sessions. Other parts, such as stakeholder involvement, peer reviews, prototyping and testing, can all be modular components of the process, as needed. SiD guides designers and decision-makers in incorporating problems beyond material and energy use, so to include social, ecological, economic, and political issues to find sustainable solutions. 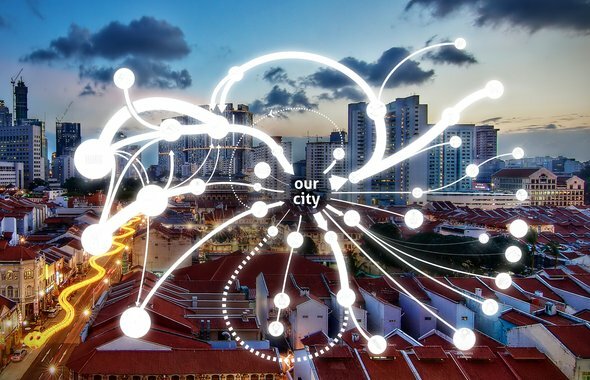 If we ever hope to achieve sustainability, we must optimize for all of these competing areas of concern at the same time – and this is what SiD does. SiD has resulted in many unique solutions that have been proven to excel over solutions developed in a traditional way. One of the reasons we're so excited about SiD is that it provides us with the ability to leave our preconceptions at the door, and look at the world with fresh eyes and an open mind. Here are some more specific qualities of SiD. SiD steers us to look at the value of what's already there, to create better places with a minimum of physical investment. By placing systems analysis before co-creation sessions, we look with fresh eyes at the world before us, see longer term opportunities and risks, and their relationships. This leads to making the highest performance, healthiest place for people, so that people want to invest in their own situation, feel connected, inspired, and empowered. For example, in the redevelopment of the social housing neighborhood of Schiebroek-Zuid, the Except team applied SiD in a co-creation process with over 100 stakeholders, residents, and partners. When the project was complete, outlining a comprehensive redevelopment plan towards an energy, water and waste neutral neighborhood, all stakeholders had taken full ownership of the project. This allowed it to withstand various development challenges, such as the unexpected demise of the social housing corporation, and is still on its pathway today. Nature has value beyond the material, delivers free services, and can be self-maintaining. That's why SiD makes us think about applying natural systems as engines of positive redevelopment. Using SiD ELSIA, we can evaluate biodiversity, ecosystems, and their capacity for value addition, such as in the Meredin Spirulina project. Thanks to SiD we were able to identify the Spirulina algae as a natural component that could solve social, economic and redevelopment challenges in Australia, something we would not have thought about otherwise..
SiD wants to eliminate waste by closing loops, not just physical ones, but also economic and social loops. This leads to circular economies and those results desired by the blue economy. SiD's systemic approach maps systems and performs insightful analysis to be able to realize zero-energy, zero-waste, water-neutral and toxin free solutions. Because SiD evaluates challenges fully immersed in their real-world context, it finds unique solutions for every situation. Given the same challenge in a different place, SiD will come up with a different, more suitable way forward. This automatically leads to context-specific and optimized innovation. For example, for the Transbay Center project, located in downtown San Franscisco, the best solution for redeveloping an old tranportation hub turned out to be a large public rooftop park, cycling rainwater, building biodiversity, and boosting real estate value. In a similar context in downtown Shanghai real estate value was boosted through food producing skyscraper famrs using vertical agriculture and a mixed use circular program. Each context offers differences, however subtle, that allows some solutions to work better than others. 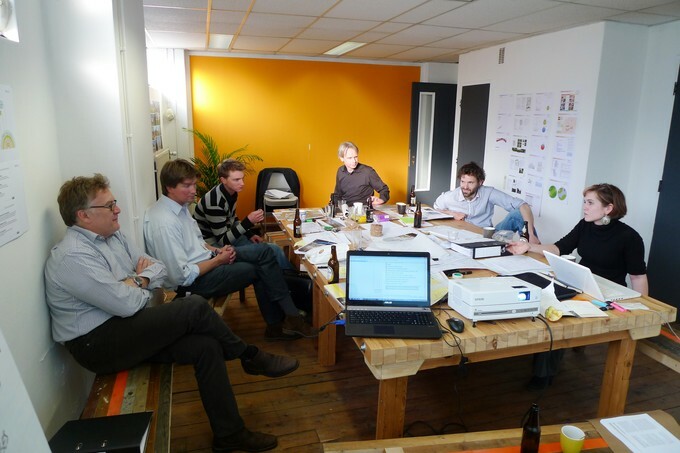 In this photo a multi-disciplinary team consisting of an environmental engineer, business developer, ecologist, communication specialist, planner, physicist and designer is working together on the Schiebroek-Zuid project. The photo was taken during a SiD session: our 5-day Innovation Lab where all intelligence of the pre-research covering the full ESLIA spectrum comes together. 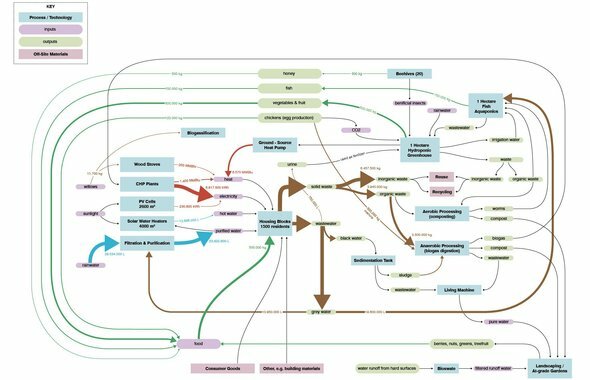 Using systems analysis and mapping new connections are found, and development pathways investigated. Rapid assessment cycles are performed on the options on the table, closed loop metabolism is generated and the social and economic effects are evaluated. If you are interested in SiD and would like to know more feel free to contact us. We regularly organize SiD workshops for companies. We'll be happy to discuss developing a workshop for your organization or community.